You really should have your beautiful cartoons in a newspaper or a magazine on a regular basis. Just love your art and writings. You do some great drawings. I love this! Love the happy face! :D Truly inspiring and warm. Reblogged this on The Valentine Review. Go on I dare you. I double dare you. I triple quadruple dare you. 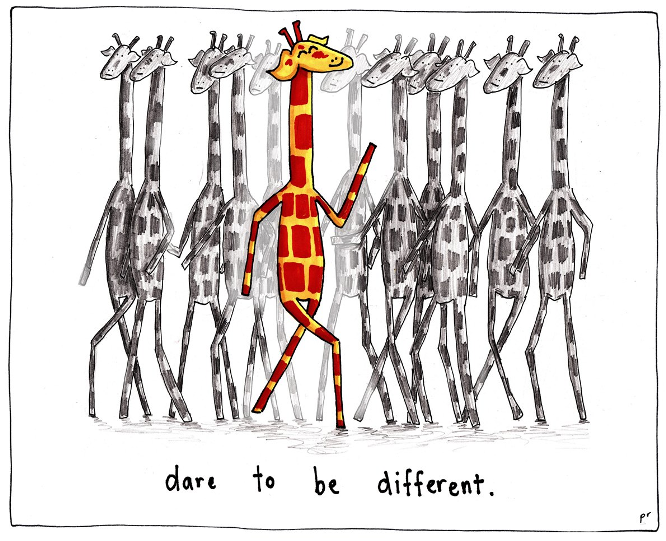 I’m so happy my Motivating Giraffe book is on its way! Thanks for making it available to buy!! Excellent :) Different is great!!! do you draw on paper or on computer? i love your work. Thank you! :) I draw on paper, then scan it up and fix it digitally. What software do you use? Illustrator? Just great, and the caption is spot on!